The 2019 Gala Dinner will pay tribute to its charter members—the first individuals and families to see and believe in the importance of the museum and its enduring role in our democratic society. Our vision and commitment have remained unwavering since our founding, and each new generation inspires us to further demonstrate our ongoing relevance in today’s world. Spotlighting the stories of charter members from across the nation, the Gala Dinner will remind attendees of just how bold and dedicated these individuals were, firmly believing in the value of a place before it even existed. The evening will also reaffirm that enthusiastic support for JANM continues today and will do so into the future as new generations engage with the museum and appreciate its values. We hope you’ll join us for this celebratory evening that remembers our past and looks forward to what lies ahead. 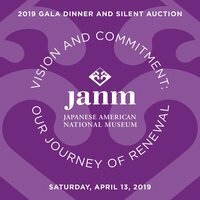 For more information about the Gala, sponsorship opportunities, individual tickets, and the 2019 Lexus Opportunity Drawing, visit janm.org/dinner2019. JANM . Última actualización Mar 19 2019 8:31 p.m.